If you are reading this post before part 1, I would like you to read part 1 so that you have context of what you are reading. In part 1, we have seen demo and usage of DATA files. In this blog I am going to talk about DELTA files. As we saw earlier each DELTA file is paired with DATA file. I must call out that DATA and DELTA files are not related to a single table but they cover a transaction range (In fact, this was a question asked by one of the reader, Manoj (Blog) in my last post). In in-memory world, when a record is deleted from the table, it’s not removed from the DATA file but a identifier is inserted in DELTA file. 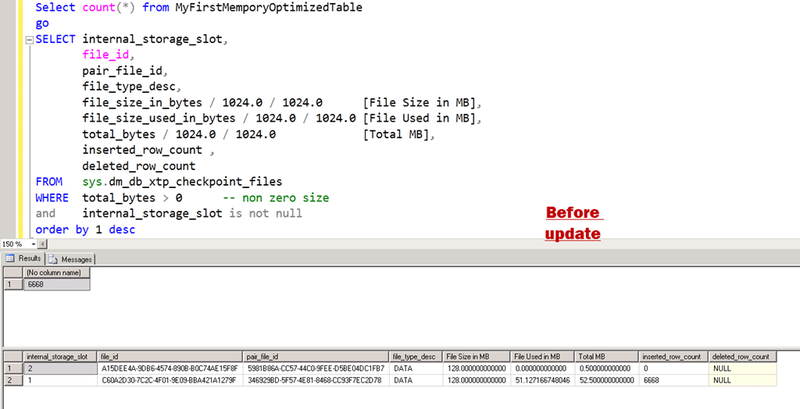 This would tell SQL Server that during loading of the data (startup of database), don’t load this particular row in memory as it’s deleted. Now, imagine a situation when we are doing an update to a row. Now, I am going to delete one third of the rows and make sure to fire a manual checkpoint. If we run the old query again. Here comes the DELTA files. Note that the internal_slot_id is zero for one pair and one for new DATA file. After sometime, if we run the exact same query again, we would see a different output. If we look at the file_id, its changed from the previous screenshot. It sounds like a checkpoint has fired by itself and has removed the reference of DELTA file. Current DATA file shows 6668 rows which is exact rows in table. There is no need of DELTA file here. Now, I am going to fire an update statement and modify all the rows and see the effect. This matches with the theory that UPDATE is split into DELETE and INSERT. We Updated 3334 rows, which caused append of 3334 rows into DELTA file and append of 3334 rows to DATA file. Each internal_storage_slot is for a range of transaction. Lower bound and upper bound are matching for consecutive slots. It is important to recall that writing (appending to be precise) to DELTA and DATA file is NOT done by any user transaction but background checkpoint thread. In our tests we are firing manual checkpoint to see the immediate effect to learn which would not be the case in production server. The background thread, scans the log buffers (and if needed, transaction log file) to append to those files. As per Hekaton Whitepaper by Kalen, below are the steps done by checkpoint. 1. All buffered writes are flushed to the data and delta files. 2. A checkpoint inventory is constructed that includes descriptors for all files from the previous checkpoint plus any files added by the current checkpoint. The inventory is hardened to the transaction log. 3. The location of the inventory is stored in the transaction log so that it is available at recovery time. Till, I wrote last few lines, another system process happened and here is the final output. We would discuss about merge process in later part of the series. 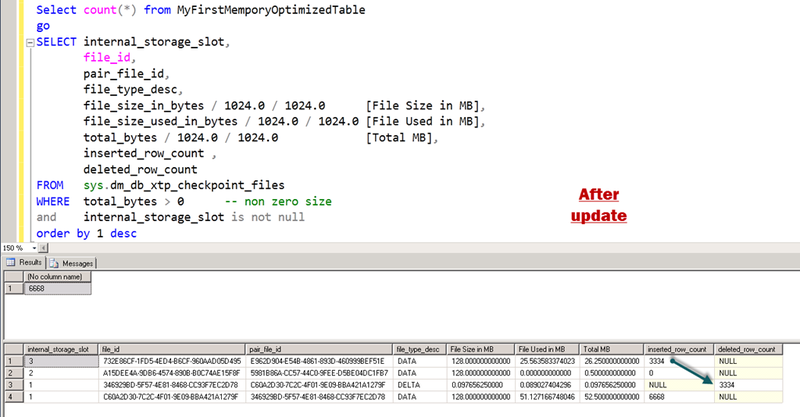 Hope you have already downloaded SQL Server 2014 CTP2 and learning In-Memory OLTP (a.k.a. Hekaton) with me. If you haven’t yet, be sure to check out the SQL Server 2014 CTP2 so that you can follow this series and get your hands dirty. This entry was posted on December 24, 2013 at 3:30 AM	and is filed under A - Z Series, Hekaton Series, In Memory OLTP, In-Memory OLTP, SQL Server 2014. Tagged: A-Z-Series, checkpoint, Hekaton, Hekaton Series, HekatonSeries, In-Memory OLTP, inmemory oltp, SQL, SQL Server 2014. You can follow any responses to this entry through the RSS 2.0 feed. You can leave a response, or trackback from your own site.